Chocolate Christmas candy is the result of combining two of my favorite things - chocolate and Christmas, of course! I love chocolate all year round, but there is just something extra special about chocolate over the holidays. I grew up enjoying a white Christmas with gently falling snow (or a blizzard) and a warm fire in the fireplace. I loved it! There is something about a white Christmas that adds to the spirit of the season for me. Unfortunately, I have not always been able to enjoy that kind of Christmas. One of the things that has really helped me "get in the Christmas Spirit" has been to whip up batches of Christmas cookies and Chocolate Christmas Candy. Believe me, it can be a real challenge to make homemade chocolate candy in the humidity, but I discovered it CAN be done if you think outside the box - or rather outside the kitchen! Yep, I usually end up making my chocolate Christmas candy in my air conditioned bedroom. Really, though, making homemade chocolate Christmas candy brings back wonderful memories of home and family. Don't you think so, too? Christmas Candy Bar Wrappers - Make your own or order them customized for you! Your Christmas Candy Favorites - Add your own favorite Christmas candy recipes and discover the best recipes other visitors have added to increase your own collection. We're always adding more Christmas recipes. Where will it all end? :) I sure hope it doesn't. In fact, how about trying out these ones? 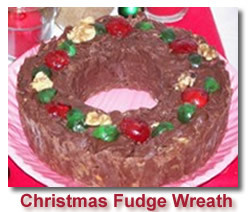 One of the most clever chocolate Christmas treat ideas is the Christmas Fudge Wreath. It is adorable and delicious, don't you think? Give it a try yourself and show off the results here! Another yummy idea is a variation of a chocolate almond truffle recipe. Try this Chocolate Almond Christmas Candy recipe. And how about the mint chocolate blend of flavors in this Chocolate Candy Cane Truffles recipe? Too much work? Then be tempted by the simplicity and delightful look of Chocolate Dipped Candy Canes , Reindeer Noses, or Chocolate Peanut Butter Balls. These recipes are so easy to make that you can easily let the kids help. Make it a Christmas family tradition! Or what about Christmas Cookies? They're a lot of fun to make and delicious to eat or give as gifts throughout the season. Living so far from my family, I still like to treat them to some chocolate Christmas candy. Unfortunately, my creative efforts would never survive the journey home. Instead, I have found some wonderful online resources that have helped me provide that special homemade candy gift by proxy. If you want to buy Christmas candy, allow me to recommend some companies to you. Each of these links will open in a new page so you can come back and browse through the list at your leisure. I have no doubt you will find something splendid! zChocolat.com - for first class gourmet chocolates. Gourmet Gift Baskets - for wonderful gift basket anyone would love. Dan's Chocolates - for scrumptious boxed chocolates. Candy Warehouse, and Candy Crate - for buying in bulk to make up your own chocolate candy Christmas gifts. 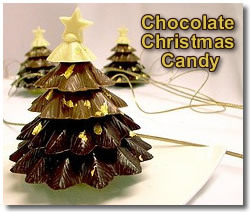 These are some ideas that I have come across to give your Homemade Chocolate Christmas Candy to others. Collect pretty tins to use for giving gifts of Chocolate Christmas Candy. Line with foil and layer chocolates between waxed paper. Spray the outside of an egg carton with red, green, gold, or silver paint. Using tissue paper, line each section inside and drop in a piece of homemade chocolate Christmas candy. Decorate with a festive bow. Keep your eyes open for pretty candy dishes throughout the year. If you are like me and can't afford to buy a bunch of brand new ones, look at garage sales, second hand shops, or even in the back of your own cupboards. Fill with homemade candies, wrap with cellophane, and tie with ribbon. These make lovely gifts that can be used even after your chocolate gift is long gone. Red or green plastic picnic plates can be prettied up with a paper doily and a selection of your homemade chocolate Christmas candy. These are nice to take along when you are invited out as a guest at someone else's house during the holiday season. Get a group of ladies from your church or club to sign up for a Chocolate Christmas Candy Exchange. Each person makes a different recipe and prepares a small plate for each lady on the list. This is especially fun because it will enable you to try a variety of new Christmas candy with a lot less effort. Don't forget to ask each lady to include a copy of the recipe with each plate. Who knows, you may discover the treasure of a new favorite. I hope these ideas have started to get you thinking and excited about giving this holiday season. No doubt you will be a blessing to someone and really make their day. Please allow me to wish you and your family a beautiful Christmas this year. Don't forget to take time to think of Jesus Christ and His wonderful gift to us during this lovely holiday season. I am so grateful that He came to this earth to provide Salvation through His own death, burial, and resurrection. May the true spirit of Christmas give you joy and peace. Do you have a family tradition that includes a special kind of Christmas candy? Perhaps you are starting your own new tradition with a recipe you just love. Add your recipes to this collection and share the spirit of Christmas with friends around the world! Don't forget to add some photos if you have any to show off. (Example - "Grandma's Chocolate Almond Tassies"
Flavoring Dark And Milk Chocolate?